The Middle East is not without its areas ripe for insurgency. With ISIS being pushed out of its territory in Iraq and Syria, where will it go next? Since even before Iraqi, Syrian, Russian, Iranian, and coalition forces started to retake swathes of former Islamic State of Iraq and al-Sham (ISIS) territory, the terrorist group has always kept operations in countries within the region and around the world. Most notably, its operations in Europe, Southeast Asia, and West Africa have shocked international observers. Additionally, organized ISIS activity in Libya, Yemen, and Egypt has yet to be curbed effectively. The Sahara and the Sahel, including Algeria and Mali, are prime territory for the traditional Al-Qaeda-style terror network hiding in rural villages. Whether ISIS will continue its attempt at a state structure somewhere else or move to an underground network like Al-Qaeda, its global brand means that it will continue to be a lightning rod for jihadists around the world. Regardless of the future of its state structure, its legacy will inspire acts of terrorism like the ones in Paris, Orlando, Ottawa, and others. With such a versatile ideology, attracting wealthy and poor, urban and rural, what is the next step for ISIS after its pseudo-state is eroded in Syria and Iraq? First, it is important to note that the conditions that produced ISIS, or at least allowed for it to grow, have worsened considerably. First under ISIS and now under Iranian-backed Shia militias, the Sunni population of Iraq is suffering with few groups fighting for their interests. The Sunni-Shia rift is deepening, exacerbated by increasing Iranian influence in both Iraq and Syria. Meanwhile, Sunnis perceive American cooperation with Iran (e.g. the Iran nuclear deal) as interest in rapprochement with the Islamic Republic, fueling a new kind of anti-Americanism. As long as conditions remain unlivable and continue to worsen, the jihadist insurgency in Iraq will survive. Whether or not ISIS survives as an Iraqi phenomenon remains to be seen, but the pace at which their psuedo-state is being degraded suggests that their continued existence would necessitate a revamped strategy - perhaps one without a territorial Caliphate. Under Shia militias, Sunni political disenfranchisement will fuel the ongoing insurgency. But as their state structure is degraded, where will ISIS seek to export its insurgency? The ever-mutating relationship between ISIS and Al-Qaeda could produce a fruitful (albeit limited) alliance in places like Yemen, the Maghreb, or Afghanistan. Although the groups' leaders are at odds, the recruitment base differs much less. The jihadist civil war between ISIS and Al-Qaeda will not likely end soon - unless leadership changes in Al-Qaeda facilitate acceptance of the caliphal legitimacy. The grandiosity of the caliphate gave ISIS a global brand that is unlikely to wane, meaning it will remain a dominant force in the jihadi world after Iraq and Syria. Although Al-Zawahiri remains in control of Al-Qaeda, developing conditions may find its franchises seeking a more powerful network with global influence. Al-Qaeda in the Arabian Peninsula (AQAP) or Al-Qaeda in the Islamic Maghreb (AQIM) could break away from Al-Qaeda Central (AQC) and develop closer ties with remaining ISIS networks, like Boko Haram did in West Africa. Salafist jihadist organizations across Africa and the Middle East could form a more cohesive force in the face of fragmentation in their former strongholds, Iraq and Syria. The ripest area for jihadist activity for the near future is the Sinai Peninsula. A stone's throw from Israel, Gaza, Jordan, and Saudi Arabia, Egypt's desert peninsula is a hotbed for terrorist activity. Egypt's largest terror attack in modern history took place at a Sufi mosque in the Sinai: one of many ISIS attacks in recent years. Al-Sisi has ramped up his military presence in the Sinai, but the terrorist insurgency is still thriving. In 2014, Ansar Beit al-Maqdis pledged allegiance to ISIS and became Wilayat Sinai (Sinai Province), giving the group an established foothold in Egypt. Like its other bases in various Arab and Muslim countries, Wilayat Sinai became a propaganda machine for the ISIS brand. Its successful terrorist attacks against the "infidel" Egyptian state highlight the group's regional aspirations and threaten to further destabilize Al-Sisi's government. Arab monarchies in the region are at risk of an intensified jihadist threat. The enhanced threat is partly as a result of their contributions to the campaign against ISIS, but Saudi Arabia, UAE, and Jordan in particular are conspicuously free of major attacks like the ones in neighbouring countries, despite their years-long coalition involvement. The current development is that the threat stemming from a state of war is coupled with a wave of incoming jihadists. Returning ISIS fighters may seek to export their insurgency to their home countries, especially Saudi Arabia and Jordan, after the territorial caliphate is rolled back. Thousands of fighters, a disproportionate number from Saudi Arabia and Jordan, left to join ISIS and are now returning from the battlefield. The group's founder, Al-Zarqawi, famously sought the overthrow of his country's monarchy, the Jordanian Hashemites. Saudi Arabia, once a prisoner of Wahhabi imams, is undergoing an uneasy modernization with its new crown prince. The clerical class is losing its power, and conservative elements in Saudi society may prove to be sympathetic to ISIS ideals. The Arab monarchies will be faced with a multifaceted problem in the near future - perhaps more difficult than the Arab Spring. The elimination of the caliphate from Iraqi and Syrian territory will not be the end for the group. Their presence throughout the region will be exploited to keep the ISIS brand relevant, and the use of terrorist attacks will continue in Arab and Muslim countries as well as in the West. Territorial control will be expanded where possible, including in Chechnya, West Africa, Egypt, and wherever else they manage to maintain a foothold. Time will tell if Abu Bakr al-Baghdadi will survive the Iraqi and Syrian campaign or if he will need to set up a new caliphal capital elsewhere. More than likely he will need to go underground like Bin Laden, unless ISIS is able to carve out a territory large enough in which to hide. In order to contain it, opponents of ISIS must take a flexible approach as its strategy changes. Western policy must reflect the situation on the ground with respect to Sunni-Shia relations - that is to say that backing Shia militias will have unintended consequences. The fight against ISIS is the fight against the social conditions in which it thrived, and unfortunately the current trend doesn't bode well. 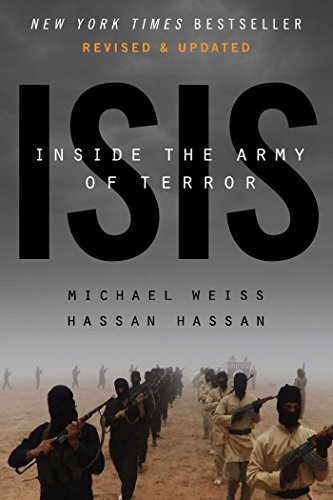 Today's book recommendation is Michael Weiss and Hassan Hassan's ISIS: Inside the Army of Terror.